Vivienne Westwood, Kate Moss and Another Man hosted an intimate and exclusive party at Lou Lou’s of Mayfair, London. 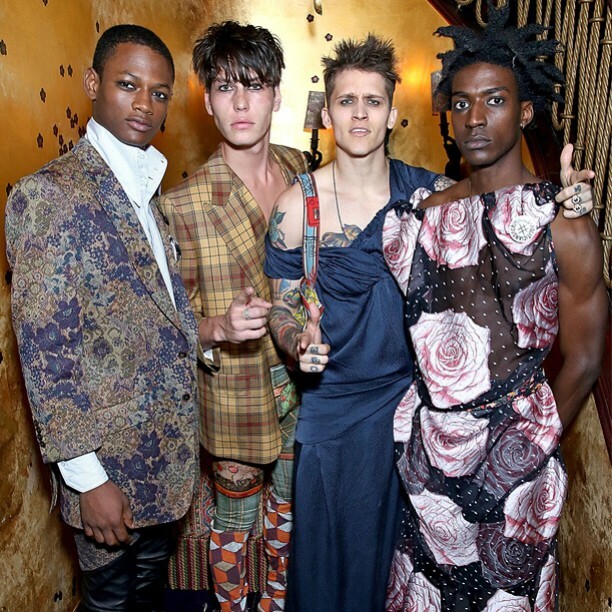 The theme for the evening was Psychedelic Unisex- to celebrate 10 years of Another Man, and launch Vivienne Westwood’s bespoke hand-made UNISEX tailoring. The event brought together key contributors and style icons from Another Man spanning the last decade, as well as cultural influencers from the worlds of fashion and music including Kate Moss, Vivienne Westwood, Harry Styles, Alister Mackie, Jarvis Cocker, David Sims, Samantha Morton, Alice Dellal, Bella Freud, Katie Hillier, Luella Bartley, Ben Cobb, Bobby Gillespie, Gareth Pugh, Paul Simonon and Ellen Von Unwerth. Amongst the guests were the gatecrashers- Vivienne Westwood’s gang of UNISEX rebels modeling Westwood’s bespoke tailoring collection. Hand-made in England in a selection of British fabrics, the tailoring service is a new offering for the brand and will be introduced to the Vivienne Westwood MAN boutique in London from the Autumn. The evening saw revelers enjoy a selection of bespoke cocktails provided by Belvedere Vodka including Belvedere Classic Vodka Martini, Belvedere Zaphyr and a Polish Mule and Ruinart Champagne. Guests danced to a rock ‘n’ roll soundtrack provided by DJ Rhys Webb, Jarvis Cocker and Tim Rockins plus a psychedelic live set by Telegram.